1) Sterilize Your Seedling Pots with Bleach and Water: I think this advice makes good sense. We don't want our young emerging seedlings to be overcome by destructive pathogens. By killing off all offending fungi and bacteria, we ensure a nice sterile environment for the seeds to thrive. THE CHALLENGE: In concept, this sounds great. But in practice, it can become cumbersome. I've cleaned and bleached all of my seedling containers. It felt great! But that lasted for about a month. I soon used them all and had to start reusing them. Springtime is SO busy! I don't always have time to mix up a batch of bleach and water. That is especially true when I only have a couple of pots that need cleaned. I might be doing good to just get a potting mix together and throwing in my seeds. THE REALITY: So after years of playing it safe, I started taking chances. After all, we don't sterilize the dirt outside, when we direct sow our seeds, right? So I stopped using bleach. Just some Dawn soap and hot water. Sometimes no soap -just a quick rinse. If potting mix fell on the ground, I'd just scrape it up and plant my seeds in it. The results? It never seemed to matter. To avoid diseased seedlings, I've shifted my focus. Plants need high light levels which include UV spectrum for optimal immunity. So I opt for strong grow lights. To get the most from a light source, I try to avoid overcrowding of my seedlings. Make sure nutrients are well supplied. Provide adequate air circulation. And quite importantly, don't over-water them! 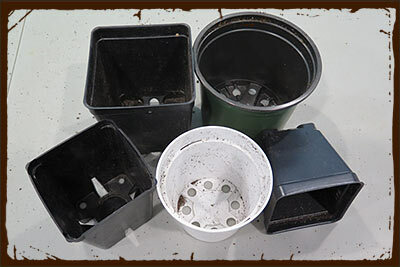 The bottom line: Keeping seedling trays and containers sterile is great advice. But if my life is chaotic and I'm feeling overwhelmed, this is a corner I can cut in the Spring. Then in the Fall, I gather up everything and clean it all, in one big batch.